I seem to be unable to stop digging in and reflecting on When Things Fall Apart. My memories range over its engagements with this book, most of the circumstances blurred and dissipate, but not the wisdom of the text. I was trying to explain to my teens the odd euphoria that follows suicidal determination – what neuroscience knows as “shut-down.” As the body begins to burn, or be ripped apart by fangs, riddled with bullets or smashed into bits…pain ceases to be useful to the organism and it is flooded with endorphins…a kind of blissed-out euphoria like a systemic morphine drip. 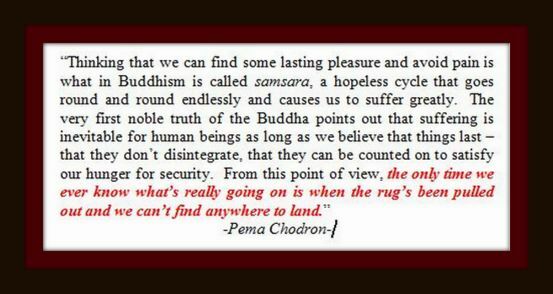 “There is definitely something tender and throbbing about groundlessness,” Pema says. I think in that book is where I first read we should not hope (which seemed radical) because to hope means we are not happy where we are, but if we want to change the equation we have to change our patterns. Buddhism is all about taking responsibility. Nice song to accompany the text! indeed. Chodron, Nhat Hanh, Rick Hanson, Cheri Huber and the like have such a gentle way of pinning us to our lives. It’s difficult to discuss this because thinking and words seem to destroy the principles.